Independent Sovereign Bond Analyst Claire Meier and DataLend Product Specialist Gareth Vass investigate the bond markets of the U.S., Latin America and Europe amidst a backdrop of trade wars and rising interest rates. THE GLOBAL ECONOMY IS going through yet another period of change. Shifting trade relationships and the threat of an outright trade war are weighing on the global outlook for growth. Whether current changes in tariffs are permanent or escalate further is up for debate, but the saying “buy the rumor, sell the fact” is apt here. The mere talk of trade wars is moving global growth expectations and market reactions. At the same time, there is no need to rely on rumors to ascertain what central banks are doing. Most major central banks have begun, or articulated that they are likely to begin, removing the exceptionally accommodative policies that have supported growth since the financial and sovereign debt crises. Economies are not as homogeneous in their recovery as they were in contraction. Central banks are struggling to create bespoke policy in a global economy dominated by U.S. Federal Reserve action. After that episode, the market seemed able to digest the hikes. The Fed hikes accelerated in 2017 and have continued that momentum thus far. The debate now begins about when the Fed will stop and what it means for the dollar. The Fed is still expected to hike one more time in 2018, but developments in the trade war arena may weigh on the appetite to continue hiking after that. Dollar strength picked up after hitting lows with the global volatility in February 2018 and has been gaining momentum ever since. The U.S.’s humming economy and outperforming stock market as well as attractive bond yields compared to other developed markets contributes to the USD appeal. If the trade wars dent the Fed’s desire to hike rates, it could also take the shine off the USD, but there are few other attractive options at the moment. Across the globe, central bank policies, political uncertainties and greater market volatility have all contributed to increases in on-loan balances in the securities lending market compared to last year. While average fees in the global fixed income market are down a couple basis points, the increase in loan balances of 26% more than makes up for this in revenue earned. The U.S. sovereign bond market, the largest in the world, is central to this increase; the on-loan value of U.S Treasurys (UST) has increased by 15% year on year (see Figure 1). Five main factors all contribute to the demand for USTs: short covering, funding, high-quality liquid assets (HQLA), cross-currency basis and specials. The increasing rate environment provides opportunities for dealers to take directional views on interest rates rather than being range bound. It also provides opportunities for larger spreads for lenders who take cash as collateral and reinvest the proceeds. On-loan balances versus cash collateral are up 12% in 2018 compared to 2017. The demand to borrow USTs versus non-cash collateral has also increased substantially, up 15% in 2018 compared to 2017. Increased noncash collateral usage is being driven by several main factors. The first is the regulatory environment, both from a balance sheet perspective and liquidity ratio, with dealers paying to swap their high-capital-cost, lower-rated bonds for HQLA. The other factor is the crosscurrency basis, in particular USD/ JPY; this has become narrower this year but still remains a driving factor in the demand for USTs to be able to generate USD cash to swap in the forward foreign exchange (FX) market. The last main driver is the specials market—bonds that are in specific demand trading at higher fees than general collateral (GC). However, the recent supply issuance of bonds and notes has limited the amount of bonds trading with considerably more value than GC. Just over 90% of USTs trade in the 0 to 20 bps fee range. While the degree to which these factors will fluctuate over time is up for debate, the strong demand for USTs seems likely to stay and provide securities lenders with a core revenue stream. The Fed rate hikes have far-reaching implications for the rest of the world, none more so than the countries that have USD-denominated debt and volatile domestic stories. Mexico, Brazil and Argentina are all such examples, and have seen the servicing payments increase substantially due to rate increases and a plunging local currency versus the dollar. The electoral cycle in particular has put pressure on Mexico. Polls correctly foresaw the election of three-time left wing candidate Andrés Manuel López Obrador (aka AMLO) to the office of president on July 1, 2018. AMLO’s party, Morena, became the biggest party in the Senate and the Chamber of Deputies as voters expressed their desire for change. Investors got comfortable before the vote, and Mexican bonds rallied 40 bps ahead of the vote. Now investors are likely to take a pause before jitters return around what AMLO and Morena will do with their newfound power. It remains to be seen if the new administration will choose the Venezuela or Brazil path, though current market levels and rational deduction suggest Brazil. This rate increase and political pressure creates uncertainty, resulting in rising utilization rates in the securities finance market—up from 6% in September 2017 to just under 12% in August 2018. 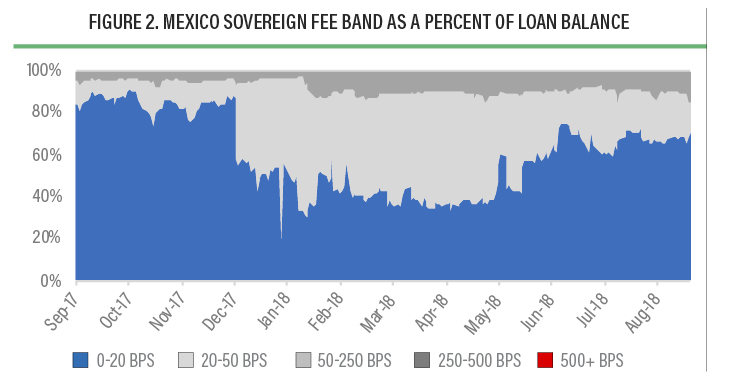 On-loan values of Mexican sovereign bonds have been going up steadily throughout the year and are currently at approximately $1.4 billion, all on open. The average fees paid follow the political pressure cycle: A greater percentage of bonds trading in the 20 to 50 bps in the run up to the election represented uncertainty, whereas from July we have seen a greater percentage trading in the 0 to 20 bps range (see Figure 2). The old adage that Mexico and Brazil can never perform at the same time is ringing true currently. While the Brazilian economy rebounded strongly post its 2015 and 2016 recession, domestic politics are putting pressure on growth while global trends are shifting investor appetite away from Brazilian assets. The general population is disenchanted with its political class and will likely use the general elections in October 2018 to express that view. The run up to the election and the result is likely to increase market jitters at a time when demand for Brazilian assets is already wavering. Brazil is likely to suffer due to the allure of a strong dollar on the back of continued hikes from the Fed, while the Banco Central do Brazil looks set to hold rates at 6.5% for the medium term. Brazil’s central bank also takes a very active stance to try to contain volatility outside of the traditional rate setting environment. It announced in mid- 2018 a range of operations, including FX swaps, repo and bond sales. This has fed through into the securities lending market, with available lendable values falling from a high of $5 billion down to under $4 billion in under a year. Political, currency and market volatility all weigh on the securities lending market for Brazil sovereigns: On average, 80% command a fee of 20 bps or more. Argentina also largely escapes from any explicit trade war contagion but does not share the same fiscal and political stability as its neighbors. Argentina is working through the necessary adjustments to recreate an open and market-friendly economy after years of distortion, but those adjustments are painful, and the government may not survive the implementation process. Some of the work has paid off, however, as the stock market has been announced for promotion to the main Emerging Markets indices by MSCI in May 2019. The Argentine central bank is actively engaged in supporting the peso amidst serious market pressure. The central bank has raised rates to 45% in August from 33.25% in May 2018. Uncertainty is still being felt in the securities lending market, with lendable values down approximately $3 billion, with clients restricting or selling out of underlying positions. 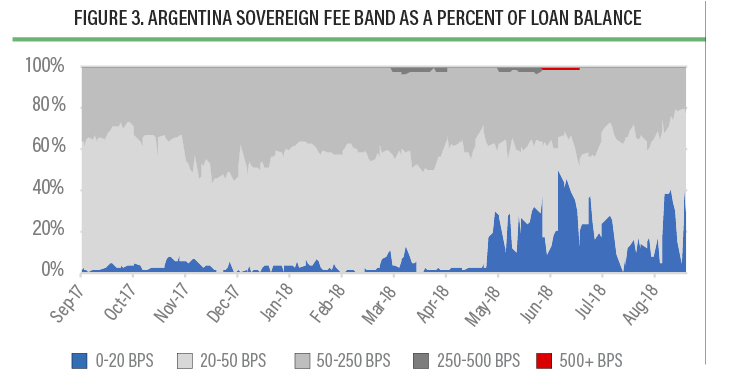 The volatility is also reflected in the approximately 86% of Argentinian sovereign bonds trading above 20 bps, and a third trading between 50 to 250 bps (see Figure 3). Since the actual day after the Brexit referendum in March 2016, U.K. markets have been largely immune to the constant political noise around the country leaving the U.K. The Sterling story has been one more of U.S. dollar strength than Sterling weakness. While the Fed has been actively raising rates, the Bank of England (BoE) has only managed to add 50 bps since its postreferendum cut. The last 25 bps comes on the back of contained inflation, albeit higher than its 2% target, and is garnering much criticism as the Brexit day approaches and no deal is in sight. Brexit might finally be beginning to influence the markets instead of just dominating headlines, but current market movement isn’t overwhelming yet. The securities lending market data also backs up this subdued nature in the Gilt market, with 75% of the £54 billion loan value trading between the 0 to 20 bps and the remaining between 20 and 50 bps. The overall lendable value and the utilization have remained practically unchanged from 2017 to 2018. The Sterling repo benchmark, which measures the effective cost of funding for U.K. government bonds, is relatively stable throughout the period, implying no real Brexit worries—in the short term at least. The media fixation on Brexit peters out quickly as one crosses the channel to the continent. The European Union has recently added the possibility of a trade war to its mix of domestic and institutional challenges; it, however, does not have the stress of an eager central bank. The European Central Bank (ECB) announced an end to its quantitative easing program at its meeting in June 2018, but it will be a gradual move and one that is likely to be halted should there be any hiccups in the form of disappointing data. The ECB plans to begin tapering purchases in September 2018 and end the program completely by the end of 2018. Rates are unlikely to move before the second half of 2019. The euro strengthened on the back of dollar weakness during the February 2018 volatility, but didn’t really react to the ECB news in June. By summer, dollar strength dominated domestic stories, a trend likely to continue for the medium term. Even without news flow on Italy, there is little on the political spectrum short of a crisis in Germany that would weaken the euro independently. If growth or German data were significantly weaker, the ECB would likely halt its tapering and thus also support euro levels, though it may take some time to act. The EU already had its mini trade war with the U.S., and while some tariffs remain elevated, an increase in tensions was averted after a friendly Washington, D.C., summit between President Trump and European Commission Chief Jean-Claude Juncker. The EU can now return to its variety of other challenges. Italy’s anti-EU stance is currently making the biggest impact in European markets. However, that impact is highly concentrated on Italian sovereign and bank paper. The sovereign paper is the obvious first place to express a view on the country. There are a lot of bonds and previously a lot of liquidity, which made it easy to express a negative view on the direction of the country based on the current administration’s desire to exit the euro and the EU. The banks are the logical next step given the close relationship with the sovereign. Italian banks never cleaned up their balance sheets post financial and sovereign debt crisis and remain in bad shape. On the whole, the sector will need government financial and political support to clean up their balance sheets, which so far has been shaky. That will continue to be a difficult circle to square given EU prohibitions on bank bailouts, the political climate on bank bailouts and the lack of money to fund bailouts. But we don’t see a sell-off in the euro on the back of the Italian stress, at least not yet, and Italian corporates with a global focus are largely escaping the current investor backlash. The ECB has announced its tapering, but if there were to be any risk of contagion from Italy to the wider Eurozone, it is likely the ECB would halt its retreat from accommodative policy. Investor concerns were reflected in the Italian bond market sell off at the end of May as investors became wary of lending to the Italian government. This filtered through into the securities lending market, with total lendable values falling from $90 billion in April 2018 to around $77 billion in June as underlying clients sold or restricted positions. 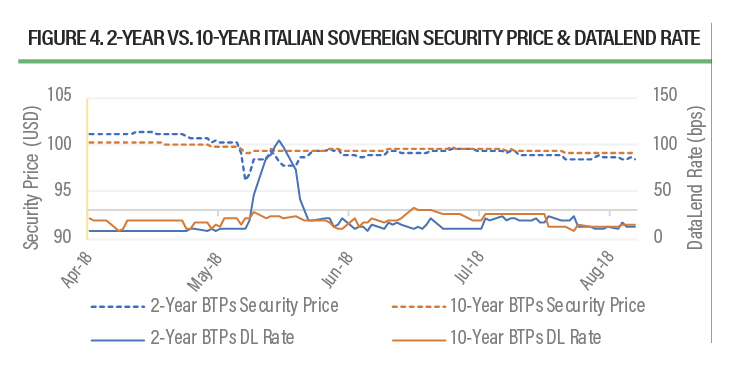 For the Italian government bond positions remaining, however, utilization increased to as high as 30%, and fees spiked by 10 bps over the last week in May. In particular, two-year Italian bonds, the most sensitive to sovereign credit risk yields, rose substantially. This was also represented clearly in the securities lending space—as the bond price fell, the average fees jumped from 10 bps to over 100 bps. In contrast, the 10-year average fees only increased to just under 30 bps for the same period (see Figure 4). Industry utilization for both the two-year and 10-year jumped in parallel in May; however, the two-year was more in demand with approximately 20% more out on loan than the 10-year during late May and early June 2018. These fears do not have seem to have filtered through into the largest Italian corporate sector in the securities lending space. ENI and ENEL in the Energy sector, along with UniCredit group and Intesa Sanpaolo in the banking sector, all remained relatively unmoved in trading around 20 bps over the same period. The market is looking for facts on trade developments, and right now a lot of rumors are coloring growth outlooks and market valuations. Trade-sensitive countries like Canada, Mexico and China are vulnerable to U.S. policy changes. At the same time, emerging market valuations will be sensitive to global monetary policy decisions and contagion from weaker members of the asset class. Volatility only recently re-entered the market’s vernacular, and trade and monetary policy are likely to be the biggest global forces on bond spreads this year. However, as apparent in the positive relative performance of Italian corporates versus Italian sovereign and bank paper, idiosyncratic stories will drive valuations as well.